Nothing beats hot soup on a cold winters day. Add an aged-cheddar sandwich, and you get the ultimate comfort meal! Luckily, my grandmother was growing butternut squash in her garden, and generously donated one to me! This soup is incredibly delicious, aromatic, and filling – not to mention it’s ridiculously simple to make! Slice the onions, and chop the garlic. Toss the onions in a heated pot along with some olive oil (2 tbsp). Stir them until they turn translucent and add in the garlic. Add the freshly grated ginger along with the cinnamon and stir. After a minute or two, add in the butternut squash and the vegetable broth (add enough broth so that it’s just covering the squash – or you can add more depending on how you like the consistency). Stir the contents in the pot, and keep te heat at medium to medium-low temperature. You’ll discover that the soup is essentially done when the squash looks mushy. At this point, take the pot off the heat, and blend the soup using an immersion blender. 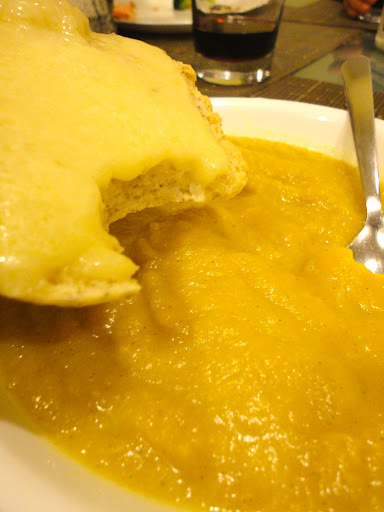 I accompanied my soup with a delicious aged-cheddar, gluten-free sandwich, using rice bread from Organic Oven. Organic Oven is a great bakery in Toronto offering tons of gluten-free products! My favourite are their fresh breads, especially bagels! I’m not a fan of the frozen bagels at the grocery store, and these ones are just so delicious! The last time I went, I bought a whole bunch of bagels and froze them. They taste just as fresh when you pop them back into the toaster oven!